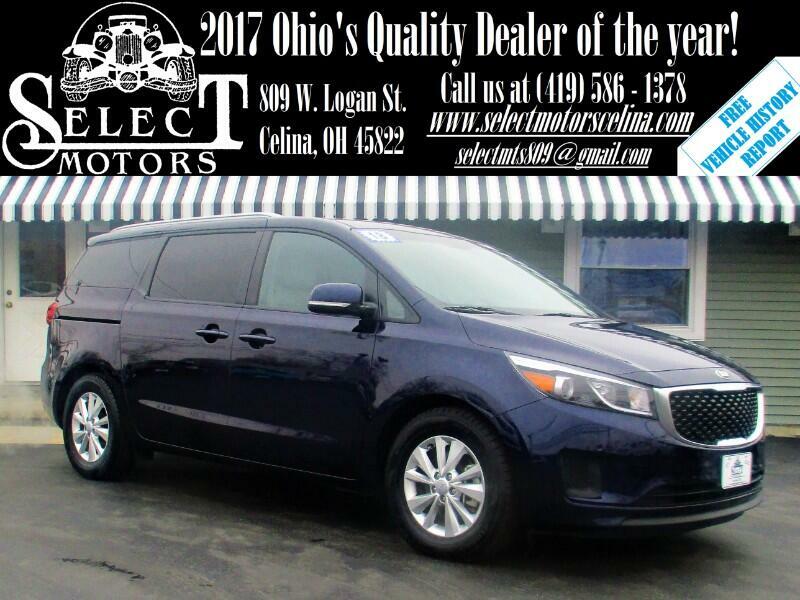 ***TXT US @: (419) 362 - 6200*** Navigation capable (Apple/Android CarPlay), heated leather seats, backup camera/sensors, front parking sensors, automatic headlights, signal mirrors, power windows/locks/mirrors, keyless entry, AM/FM, SiriusXM, auxiliary and USB port, steering wheel mounted audio controls, Bluetooth, tilt and telescopic steering wheel, cruise control, information center, 17" alloy wheels. Warranties: Balance of Kia's 5 year or 60,000 mile bumper to bumper. In service date: 05/24/2018. Extended service contracts available. The Kia Sedona minivan can accommodate up to eight passengers and is available in five trim levels: L, LX, EX, SX and SX Limited. All models are powered by a 3.3-liter V6 engine (276 horsepower and 248 pound-feet of torque) that sends power to the front wheels via a six-speed automatic transmission. Standard feature highlights for the Sedona's base L trim include 17-inch alloy wheels, Slide-N-Stow forward collapsing second-row captain's chairs (reducing seating capacity to seven), stain-resistant cloth upholstery, a 60/40-split reclining and folding third-row bench seat, air-conditioning with rear controls, Bluetooth, a 5-inch touchscreen, a rearview camera and a four-speaker sound system with a USB input. The LX trim adds power-folding mirrors, power-sliding doors, rear privacy glass, a second-row bench seat (increasing passenger capacity to eight), a power driver seat and a six-speaker audio system. The EX hits what we think is the sweet spot of the Sedona lineup. On this trim you also get 18-inch wheels, foglights, heated mirrors, roof rails, a height-adjustable power tailgate, front and rear parking sensors, upgraded shock absorbers, keyless ignition and entry, an auto-dimming rearview mirror, tri-zone automatic climate control, leather upholstery, heated front seats, sunshades for the second and third rows, a cooled glovebox, a portable flashlight, a 7-inch display, UVO3 eServices emergency telematics and additional USB charge ports. The SX trim reverts back to the seven-passenger configuration with second-row captain's chairs (the bench is available as an option) and adds a power front passenger seat, ventilated front seats, driver-seat memory functions, heated second-row seats, an 8-inch touchscreen, a navigation system, Apple CarPlay and Android Auto smartphone app integration and an eight-speaker Infinity premium audio system. A blind-spot monitoring system with rear cross-traffic alert is also included. The range-topping eight-passenger SX Limited trim adds 19-inch wheels, adaptive xenon headlights, adaptive cruise control, a heated steering wheel and a household power outlet. Even more advanced safety features come with the SX Limited, including forward collision warning and mitigation (with automatic emergency braking), a lane departure warning system and a surround-view camera system. Many features on the higher trims are available as options on the lower trims. Other add-ons such as a dual-panel sunroof, first-class lounge-style seating for the second row (without Slide-N-Stow) and premium leather upholstery are available only on the SX Limited trim. A rear-seat DVD entertainment system is offered on all models.